"The object of this Company is to provide a vehicle for the presentation of musical and theatrical performances for the cultural advancement and enjoyment of the community of Simsbury and surrounding towns. Said Company shall be a non-profit organization and all of its net earnings shall be used in carrying out charitable and educational purposes." 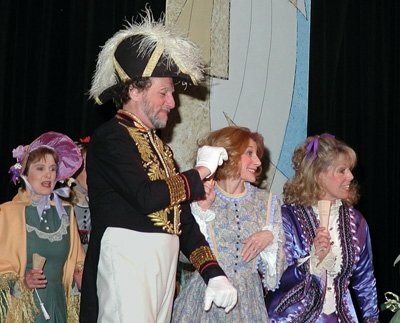 SLOCO has performed all but one of the Gilbert and Sullivan operettas, The Grand Duke. Our repertoire has included The Merry Widow by Franz Lehar, Of Thee I Sing by George and Ira Gershwin, Die Fledermaus by Johann Strauss and Vagabond King by Rudolf Friml. We have sung throughout CT and MA, with the Hartford Symphony, CT Concert Opera, Soni Fidelis, at the Governor’s Mansion, Wadsworth Atheneum’s Festival of Trees and even on CBS This Morning! While putting on the highest quality production, our aim is to do so while enjoying ourselves and sharing the camaraderie that comes from being part of the SLOCO “family”. Many of our talented singers have gone on to further their careers at the Yale School of Music, Connecticut Opera, Opera North, Commonwealth Opera of Western Massachusetts, Chicago Lyric Opera, New York City Opera and the Metropolitan Opera. And, for the two years before his untimely death, the venerable Martyn Green, Mr. Gilbert and Sullivan himself, was our artistic director.